In the face of the current “tarifazo” of Mauricio Macri goverment (massive hikes in electricity and gas prices) and financial hardship, Zanon workers have launched a national and international campaign to establish a Solidarity Fund in defense of workers’ self-management at the plant. Read their letter from the workers of Zanon bajo control obrero (Zanon under worker control), calling for solidarity and donations. 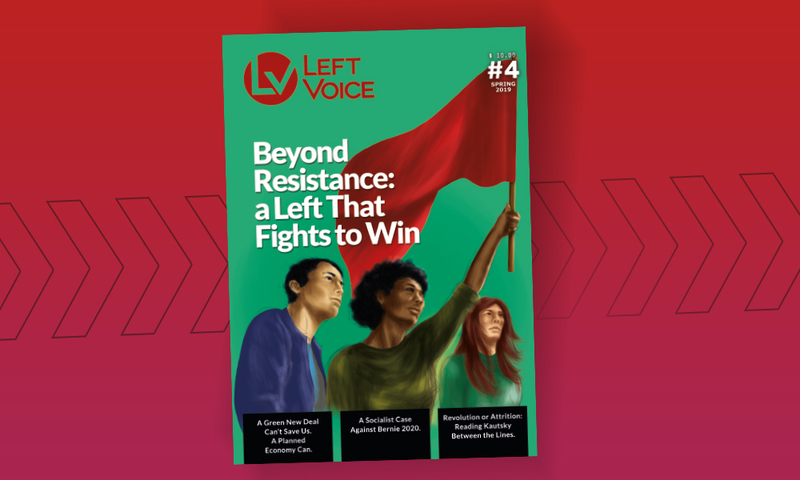 In support of the current campaign, Left Voice shares a history of this heroic struggle, from three articles published in 2009. “Eight years have already passed: we do not want any more talk, we want expropriation!” shouted the ceramic tile workers of the Zanon factory. Accompanied by an impressive column of public sector workers, teachers, health workers, social organizations and left-wing parties, they made their way to the Neuquén legislature, where the expropriation of the factory was about to be presented. The Patagonian wind blew cold and strong, making the wait in front of the provincial congress unbearable. These ceramic workers who, eight years earlier, had dared to take over the plant and re-start production, have made their epic story a part of the best pages of working-class history of our country. These workers were now proudly singing, “aquí están, estos son, los obreros de Zanon” (“Here they are, these are them, the workers of Zanon”) until their throats grew hoarse. In the days before, Neuquén was a hotbed of activity. Despite the fact that the governor had come down in favor of expropriation, complaints were heard from within his own party, the MPN (Movimiento Popular Neuquino), from the right-wing opposition, and from leaders of the Confederación General del Trabajo (CGT – General Confederation of Labour), because the factory was being handed over to ‘leftists’ ‘criminals’. They spared no insult in their efforts to discredit the struggle of the tile workers. The CGT union bureaucracy and the Chamber of Commerce spoke out against the expropriation. But they couldn’t stop it. A large column led by a banner reading “Carlos Fuentealba presente” (Carlos Fuentealba is with us) was the symbol of the march — a united front of those who supported the struggle of the ceramic workers for expropriation and of those fighting for justice for the teacher assassinated in Arroyito. 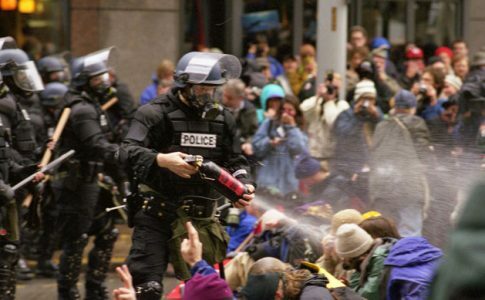 Carlos Fuentealba was one of the hundreds of teachers that surrounded Zanon on April 8, 2003, to prevent the attempted eviction of the workers from the factory. Walking up Avenida Argentina, the workers made their voices heard: “No le damos tregua, que se vayan a la mierda” (We will not give in, they can go to hell). These workers wanted everyone to know that just because they had been promised the expropriation of the factory, they would not stop fighting or give up supporting every workers’ and popular struggle. The long and tedious legislative session took place in the presence of a delegation of 50 compañeros. 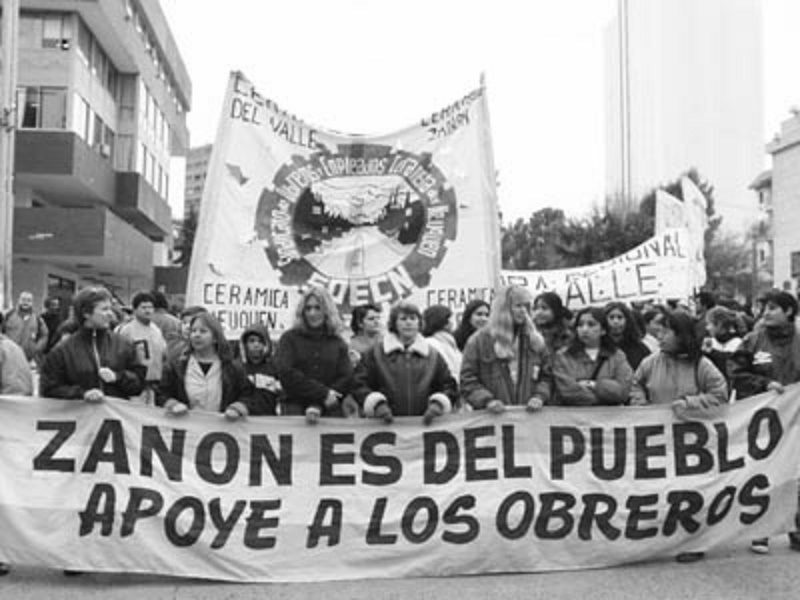 A prominent delegation of Zanon veterans were accompanied by the Mothers of the Plaza de Mayo from Neuquén, delegations from the Central de Trabajadores de la Argentina (CTA) union federation, workers from INDEC [National Statistics and Census Institute], the Buenos Aires Subway, the Rio Santiago Shipyard and the Brukman textile factory, just to name a few. All the while, a solidarity rally took place outside at which all of the political organizations spoke. One very moving moment occurred when the women who nine years earlier had organized the first women’s committee at Zanon took to the stage. Alejandro Lopez’s mother showed her son’s shirt from his first struggle and proudly spoke of how she had come out to support her son and his comrades. They paid tribute to those who had fallen, to Daniel Ferras, the young worker whose death, caused by management negligence, went on to unite the ceramic workers in struggle. 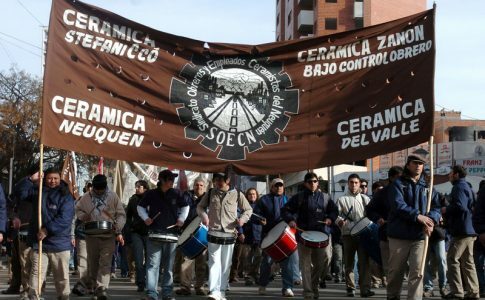 They also paid tribute to “Boquita” Jorge Esperanza, a leader within the Sindicato de Obreros y Empleados Ceramistas de Neuquén (SOECN – Ceramic Workers’ Union of Neuquén) who recently passed away. The emotion was palpable. And when it reached midnight, after that long cold Wednesday August 12, and when the bonfires could no longer keep people warm, they cast their votes in favor of expropriation. The celebrations erupted. “Finally”, they yelled, “and to think that some said we could never do it”. They sang, jumped, and embraced each other, tears rolled down weather-beaten cheeks. Some Zanon veterans remembered the end of the long 34-day strike in 2001; the celebration of that victory after such a buildup of tension. They were not wrong to make the comparison; that great strike was the beginning of what, months later, would lead to the occupation and re-starting of the most important tile factory in the country. Lolin, one of the dear Mothers of Comahue, went on stage and brought warmth to that frigid night with her encouraging words, just as she had so many times before. It was already one o’clock in the morning; everyone was still. When they began to chant “la clase obrera es una, y sin fronteras” (“the working class is one and has no borders”) it was the turn of Brazilian unionist Claudionor Brandäo from the Sindicato dos Trabalhadores da Universidade de São Paulo (SINTUSP – San Paulo University Union for non-faculty workers) to speak. Brandäo has defended and lifted up the example of Zanon and its expropriation to hundreds of thousands in Brazil who have lost their jobs. Then the leaders of Zanon spoke, the representatives who had the task of keeping the factory running — a factory that, in the midst of a capitalist crisis, maintains the livelihoods of 470 families. Reaffirming this unity, the union leaders who will be running for election in two weeks, under the name of the Lista Marrón (Brown List), stepped up to the podium. All of the speakers thanked everyone for their support and endurance, not just for that day, but during the past ten years of struggle, from the day they first won control of the factory’s Internal Commission. And there was time to hug all of the brothers and sisters who were there from the Stefani factory, who are today in the midst of their own struggle. But they’re not going to rest on their laurels. They understand that the achievement of expropriation is not the end of the road, and that the legislators would like to set a trap in the fine print (such as asking for “social peace” or for compensation payments to Zanon’s previous owners). It is for this reason that the rally voted to march to the provincial legislature the following day. This is the end of a long saga and the beginning of another, no less militant and no less difficult. For as Zanon leader, Raúl Godoy has said so many times, “Zanon no es una isla” (Zanon is not an island), and the most concrete example that illustrates this is the Stefani workers of Cutral Có, who have been on strike over the last few months in response to management provocation. The struggle of Zanon and its union continues. What has been achieved at Zanon is known across the country, and word of it has spread around the world. Over time, its prestige and importance will not diminish but will only grow; as was demonstrated in the past year. This is not just giving credit to the workers and their leadership. 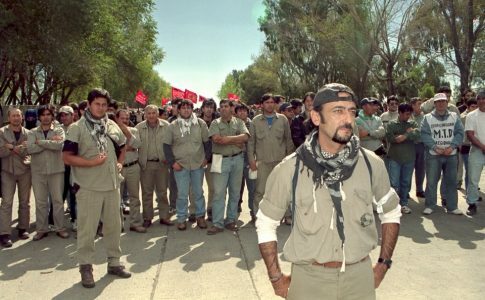 With the international capitalist crisis, which has led to millions becoming unemployed and thousands of factories closing around the world, the experience of worker-occupied factories in Argentina that began with the crisis of 2001 has become an important example and gained international attention. Eight years later, the star of Zanon shines the brightest. Their policy of workers’ control is different and far superior to the option of cooperatives, which is the course that other worker occupied businesses have taken. Along with this is their class-struggle union, their organization, their democratic methods where the workers’ assembly decides, the grassroots control over the management of the business, and their militant solidarity with dozens of other conflicts in the country. There is also their position on supporting the needy, forming what they call “work with the community”, free or inexpensive concerts with bands like La Renga, Bersuit and Attaque 77, along with others so young people in the region can enjoy concerts that are normally too expensive for them to attend. The workers of one tile factory have won its expropriation. Nobody gave it to them. And they didn’t do it by themselves; it was the overwhelming support that the workers received within the region and throughout the country. “Unidad de los trabajadores, y al que no le guste se jode, se jode” (Unity of the workers, and those who don’t like it can go screw themselves) they kept on chanting. They won its expropriation. They struggled and defeated the Neuquén government. They left the legislature happy, for they had won the battle. The frigid night preserved the echo of the war song of many long days of struggle, which of course was also present in that moment. “Viva la lucha de Zanon, que viva el control obrero, porque esta fábrica es del pueblo, en Zanon no pasarán” (Long live the struggle of Zanon, long live workers’ control, because this factory belongs to the people, and at Zanon ‘they shall not pass’). 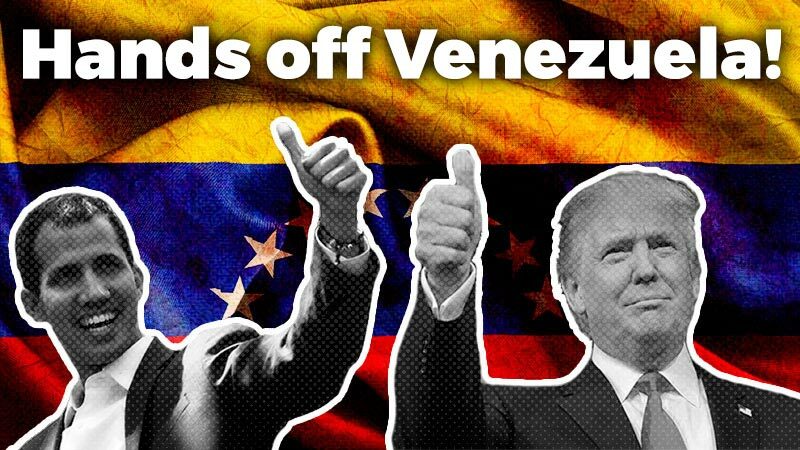 This is a translation of an article published in La Verdad Obrera (LVO – Workers’ Truth) No. 338, 13 August 2009. LVO was the newspaper of the Partido de los Trabajadores Socialistas (PTS – Socialist Workers Party) of Argentina between 1996 and 2015. I invite all the compañeros (comrades) who will soon be part of the new Steering Committee and speaking on behalf of tile workers to come up. Compañero Omar Villablanca, compañero “Chaplin”, compañero Eugenio from the Cerámica del Sur, compañeros from the Cerámica Neuquén, and the compañeros who are going to be part of the new leadership, and Chicho. They are all of the compañeros who are going to be the new leaders. Arriba (up with) the activist comrades! We all want to get to know these faces. We want to tell you all that we are so proud. 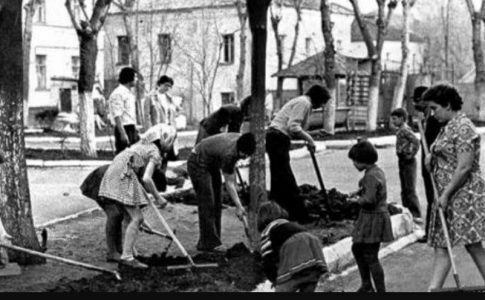 One day the HIJOS (Children – acronym for an activist organization of the children of those ‘disappeared’ under the dictatorship) came to the factory and said that in us they saw people who were just like their parents. The Mothers of the Plaza de Mayo also told us that they saw in the Zanon workers people who were just like their own children, and we feel very proud of that. In the midst of the struggle we were threatened with death. They fired rubber bullets at us. They fired lead bullets at us. And, compañeros and compañeras, we felt like we were being born again, that we were going to be reborn in this factory, just as compañero Alejandro said. This factory does not only produce tiles, it has produced free men and women. This small example, that we have contributed to, from this little place in Patagonia, has shown thousands of compañeros and compañeras around the world just what we, as workers, are capable of doing. Those that run the world, we can stop them. And we can rebuild it on different foundations, not on the foundation of exploitation. For the benefit of all humanity, and not just for the few. Compañeros, this is our small contribution, for if the past nine years have been worth anything, you need to know this: that it can be used to build a world without exploited or exploiters. Compañeros, have confidence in your own strength; long live the Zanon workers and the struggle of the working class! Here and throughout the whole world, compañeros! Compañeros, today we made it. We have taken a big step forward in a struggle that began a long time ago, as many compañeros have just said. And in there, in the legislature, there are some who, on Friday, or who knows when, want to feed us more lines, because they want us to accept social peace. There are some who come and knock on our doors to talk about peace. The CGT bureaucracy, who does not think twice about handing over worker’s right, jobs and wages; who didn’t think twice about hiring thugs to try and remove us from the factory in 2002. Phiellip came, one of the heads of ACIPAN, the bosses’ association, to talk about social peace. But he was part of the university staff during the dictatorship, the Dean of the Faculty of the Economics, appointed by Videla during the military dictatorship. And from this very faculty, two compañeros were ‘disappeared’. Those who are the bosses, and the union bureaucrats who brown nose them, hope to come to us talking about social peace. This, when there is hunger and unemployment throughout the province and the country. Because we are, once again, in the midst of a crisis, a crisis that everyone compares to the 1930s, a crisis that will force the workers and the people to take to the streets. So, we can’t expect social peace. Like Lolin said a moment ago, we are the heirs of a generation that struggled to change this society, we are the heirs of a generation that rose up. And with Zanon, we set the example that the workers can do it, that we do not have to give in, that when a boss closes down a factory it is not because everyone in the world already has a home. Zanon did not close because everyone in the world has a floor in their house. When a textile factory closes, it is not because everyone has clothes. When a factory that produces food closes, it doesn’t mean that everyone has food. So compañeros, we don’t have a right, the workers and the people have an obligation: to occupy the factories to put the factories under workers’ control; to raise a program, a perspective. Because we are the ones who keep the world running, we are the ones who keep this world moving day to day and we are the ones who have an alternative so that we are not forced to pay for this crisis. We have to stand up. Zanon is just one step. There is no social peace! There is an obligation to fight for what we deserve, for work and for bread for us and our families.